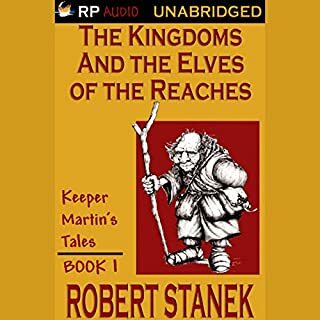 I just listened to the LOTR read by Rob Inglis, which I must say was fantastic and extremely well acted (if you can say that for an audio book). I also really enjoyed Eragorn from audible and the Harry Potter books all of which were well read. This book however was almost impossible to follow. This was 90% due the speed of the reading and the poor fake accent. I got the impression like the narrator had some sort of time deadline to fulfill and frantically read in an extremely poor English Accent? I live in Japan and I know many British people none of which sound even remotely like this author. His style was nearly as painful as watching Keanu Reaves in a love scene, just poor. If there were a way to preview this book like taking a peak into an Amazon book you would see what I mean. If you can believe it I had to put the book on the slow setting on my iPod to bring the author down to a normal digestible pace. Unfortunately the painfully superfluous mystical accent still came through. In the defense of the book I could have understood it better if I was not engaged in other activities like jogging. Want to hear a fantastic book with a fantastic reader? Listen to Dragon Rider by Cornelia Funke read by Brendan Fraser. Possibly the best Narrated book ever. I have listened to well over 300 books since the iPod came out and this was hands down the best Narration. So don't waste your credits on this book buy Dragon Rider or buy the soft cover and use your own cheesy accent!